A UGC decision in 2010 making research compulsory for teachers to rise up the ladder prompted some to pay dubious publications to feature their work. India’s world leadership in predatory (fake) publishing is not entirely surprising. The country has a large higher education sector with 903 universities, 39,050 colleges and 10,011 stand-alone institutions. In 2010, the University Grants Commission, India’s higher education regulator, introduced the Academic Performance Indicators in which it made research compulsory for teachers across all kinds of higher education institutions, including teaching-focused colleges, for career advancement. The insistence on research from all teachers without consideration of, among others, infrastructural deficits (poor libraries and other research facilities) at the majority of institutions and poor knowledge and skills for research among most teachers, was foolish. 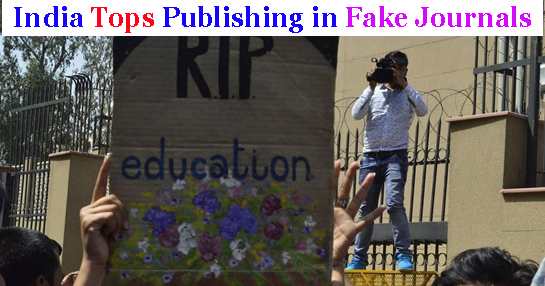 With research and publishing made compulsory, a large number of teachers took the easiest option, of publishing in fake journals.